Carrying on the Inside Line series, we move on from looking at the Mark VI Volkswagen Golf and turn our focus towards a popular MPV in its day, the Renault Espace. With the fifth generation of the Renault MPV being mooted for a 2015 launch, even though none are expected to be sold into the UK market, this month we are focusing on the Mark IV, which continued to carry the baton for what is regarded as the pioneering vehicle for the MPV sector. The Renault Espace was considered the king of the MPVs, but as the sector boomed it faced stiff competition from the likes of Ford, Citroën, Volkswagen and Vauxhall. The competition has been so intense that the Espace has not been revamped since the Mark IV came into production in 2003, as Renault looks to regain a strong foothold in the UK market. 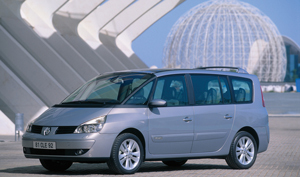 The fourth gen Renault Espace was launched with a range of powerplants in various guises, which included 2.0-, or 3.5-litre V6 petrol engines and 1.9-, 2.0-, 2.2- and a 3.0-litre V6 diesel options. This variety of engine options has provided some additional challenges.